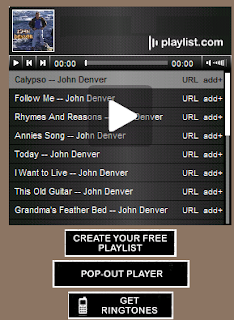 Playlist.com is a popular source for getting free music on your blog. My problem was I didn't want it to be at the bottom of the blog, but on the sidebar. The code they give you makes a music player that is much too wide for a sidebar. Here is how you can edit the code to fit whatever width you want. Your code should resemble the code below. Simply change the bold numbers from your code to smaller, or larger numbers, depending on the size you want (I only included the beginning of the code, where you need to make changes). For my sidebar I used 285 to replace 450 and then 275 to replace all the 435's.